September has arrived! Fall is my favourite time of year and while I miss summer, I always look forward to the change in weather. This year there are a number of things for me to look forward to. 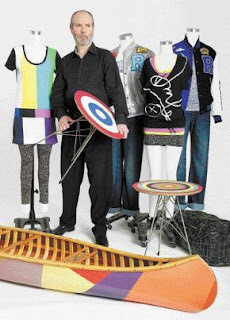 Among them is the appearance Douglas Coupland is making in Oshawa at the RMG. 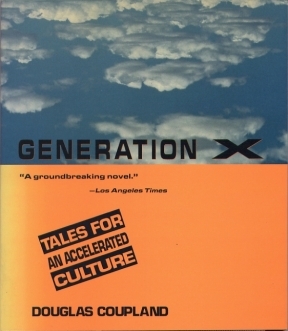 My first experience reading Coupland's works was when I visited my sister in university. I was in grade ten and her roommate had a copy of Generation X. I'm not really of the right age to be considered Generation X, as I'm a bit young. However, I related to the generational dissatisfaction, the confusion with the world and loved the general tone of the book. I went on to read many more of his works and in a lot of ways his writing influenced the sort of novels I wanted to read for many years. My favourite was Microserfs. Coupland is a writer and an artist, who has also blogged for the New York Times, designed a line with Roots Canada of clothing items inspired by the media and also writes a very funny twitter feed. His sculptural works and artistic practice are more recent, having resumed in 2000, though he was educated at Emily Carr in Vancouver with a major in sculpture, and then studied design in Italy and Japan. He said once that he became a writer by accident, after he was hired to write for a magazine based on a postcard he sent to a friend from Japan. It is funny that Coupland has created the idea of the "slacker", because he is something of a workaholic. Once quoted as saying, "I've never taken a holiday. To lie on a beach someplace seems almost sinful. What's the point of being around unless you're working on something?" he reportedly works 7 days a week. Coupland's work for Oshawa draws on the importance of the history of the abstract art collective Painters Eleven and the work holds special significance to the history of the RMG and Oshawa. It is set to be installed in the next few weeks and unveiled before the end of September. Doug Coupland will visit Oshawa on September 24th in the afternoon. Click here to see the event page.